Scott Skiles is My Coach of The Year ~ The Bucky Channel - The World of Sports from Wisconsin's Perspective. 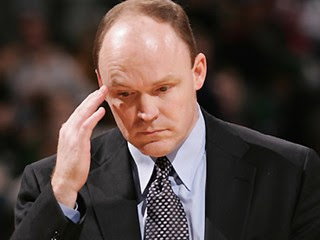 I don't get a say in the Coach of the Year voting so Scott Skiles didn't win this year, but he did take second place. He lost to a great coach in Scott Brooks who is currently guiding the Oklahoma City Thunder through the playoffs. The only thing about Brooks is he has the future of the NBA on his team in Kevin Durant. He also has a point guard that could be the next walking triple double in Russell Westbrook. Not to say he isn't doing anything to earn the award, but he does have some top names working for him which makes it easier for him. Scott Skiles on the other hand did something that no one thought this team could do. He took a Bucks team that was projected to take last in the whole Eastern Conference and made them a playoff team. He was given a gifted point guard to work with this season, but other than that he worked with what he had. He started getting Bogut into the star roll last season, and that really bloomed this season. He lost Richard Jefferson, and replaced him with a guy that played in Europe last year named Carlos Delfino. He taught this team how to play together, work hard, and most importantly have fun playing the game. The Bucks lost a lot of people to injuries this season. Michael Redd was their top scorer before he went down for the year. Bogut got hurt missed a few games during the regular season with his back. He missed the end of the regular season which cost this team from getting the 5 seed. Brandon Jennings and Luke Ridnour were the only players to play all 82 games. He didn't have one player average more than 20 points a game. This team is the definition of a team, and only one man should get credit for that. That would be the head coach Scott Skiles, that is why he is my coach of the year.